I was very disappointed when I opened an e-mail from a close friend this morning, who always forwards me articles related to horse racing. Last night, he sent me a link to a photo essay from the New York Times that appeared in this past Sunday’s edition. 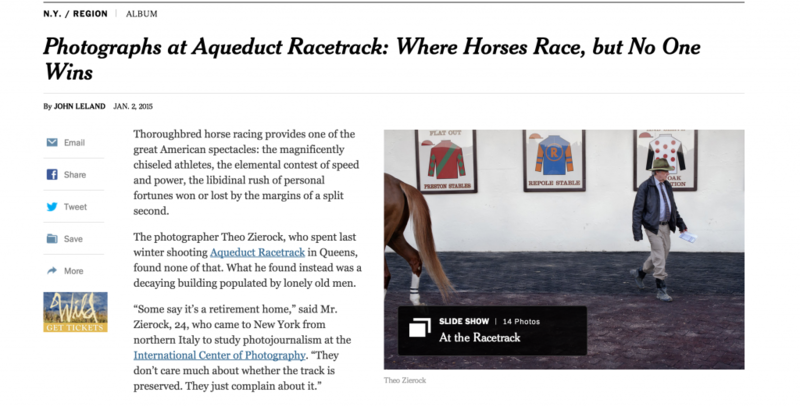 The article was written by John Leland and featured photographs from Theo Zierock, who spent last winter shooting at Aqueduct Race Track. The article can be found here. Here are a few selections of the text of the article — click on text to enlarge. As a horseplayer, this piece is very disappointing, especially given the standards of journalism at the New York Times. There is no effort to tell the stories of the people who play the races, but only to mock them. The photographs portray a pervasive culture of desperation, sadness, and anger. Yes, some horseplayers do have these traits, as do compulsive gamblers in other areas. For some, it has become an unfortunate part of the territory of playing the races. But mocking those with illnesses is not something the “paper of record” should be engaged in. It lacks empathy towards the plights of those with gambling problems, who actually (believe it or not) have good stories to tell, if you take the time to listen. It’s simply inaccurate (and unfair) to use these tales to convey a judgment on these people or to prejudicially apply it to the community as a whole. The authors assume that all players — at least at Aqueduct — are degenerate gamblers. 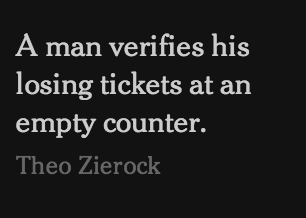 That’s an unfair and untrue assumption. There are many in the community — myself included — who love the hobby and, yes, enjoy the thrill, pursuit, and challenge of beating the odds. We love understanding races before the race and trying to predict what is going to happen. We love watching horse races and seeing how the anticipated drama unfolds in each and every race. We especially enjoy the challenge of competing at an amazing game — and, for lack of a better phrase, “putting our money where our mouth is,” all the time. For those interested in competing in understanding of probability and data analysis and are not afraid to back it up, handicapping and playing the races provides the perfect game. I’m sorry that the authors did not take the time to find this out for themselves.